Laboratory studies from the last century have shown that some types of particles are susceptible to pre-activation, i.e. they are able to develop macroscopic ice at warmer temperatures or lower relative humidities after they had been involved in an ice nucleation event before. This review analyses these works under the presumption that pre-activation occurs by ice preserved in pores, and it discusses atmospheric scenarios for which pre-activation might be important. The number of winter haze days over the north-central North China Plain in 2014 was largest in the past 30 years. With the anticyclone circulation over North China taken as an intermediate, the positive phases of the east Atlantic/west Russia, western Pacific, and Eurasian patterns led to a larger number of haze days in 2014. The related external forcing included preceding autumn Arctic sea ice, winter and pre-autumn surface temperature, and pre-autumn sea surface temperature in the Pacific. This study provides a large data set on concentrations of individual brown carbon constituents, i.e., nitrated aromatic compounds, in diverse atmospheric environments and their relative contribution to water-soluble and particulate light absorption. It extends the existing knowledge on the abundance of brown carbon and its molecular composition and provides scientific motivation for further studies on ambient brown carbon constituents. The inclusion of biogenic very-short lived bromine (VSLBr) in a chemistry-climate model produces an expansion of the ozone hole area of ~ 5 million km2, which is equivalent in magnitude to the recently estimated Antarctic ozone healing due to the reduction of anthropogenic CFCs and halons. The maximum Antarctic ozone hole depletion increases by up to 14 % when natural VSLBr are considered, but does not introduce a significant delay of the modelled ozone return date to 1980 October levels. To improve our understanding of the fate and transport of airborne dust, there is a need for long-term records of dust deposition and concentration. This study characterized the spatial and temporal distribution in dust deposition and concentration in central Asia. The occurrence of high dust deposition and concentration suggests this region is a potential contributor to the global dust budget. This work will strengthen our comprehension of aerosol transport in global desertification regions. The goal of this study is to find a parameterization scheme for general circulation models to describe immersion freezing with the ability to shift and adjust the slope of the freezing curve compared to homogeneous freezing to match experimental data. We investigated how accurate different formulations of classical nucleation theory reproduce measured immersion freezing curves for different mineral dust types. Twenty years ago we discovered that the ozone hole shape is asymmetric. This asymmetry is minimum over the Weddell Sea region and maximum over the Ross Sea area. Later we detected that the position of the ozone minimum is shifting east. We have continued to follow this event, and a couple years ago we revealed that the shift is slowing down and starting to move back. We connect all this movement with ozone hole increase; since 2000 the ozone layer has been stabilizing and recently recovering. The occurrence of nonliquid and liquid physical states of submicron atmospheric particulate matter (PM) downwind of an urban region in central Amazonia was investigated. Air masses representing background conditions, urban pollution, and regional- and continental-scale biomass were measured. Anthropogenic influences contributed to the presence of nonliquid PM in the atmospheric particle population, while liquid PM dominated during periods of biogenic influence. We assess and quantify the ozone loss driven by NOx, triggered by stratospheric warmings and the halogens-induced ozone loss, using data assimilation results over a decade. To illustrate the difference between halogen-induced loss and NOx-induced loss, we compared a relatively cold and stable winter (2010/2011) with a composite calculation of four winters (2003/2004, 2005/2006, 2008/2009 and 2012/2013) which were all affected by a major mid-winter sudden stratospheric warming event. The atmospheric chemistry associated with mixing of anthropogenic and natural species was simulated to understand how shade provided by a forest canopy impacts reactions, product distribution, and subsequent phase distribution of the products. This is important to understand, as forested areas downwind of urban areas will be impacted by this phenomenon. It was found that fast transport from below the canopy led to increases in secondary organic aerosol from nitrate radicals above the canopy. The article is devoted to the long-term evolution and variability of stratospheric aerosol, which plays an important role in climate change and the ozone layer. 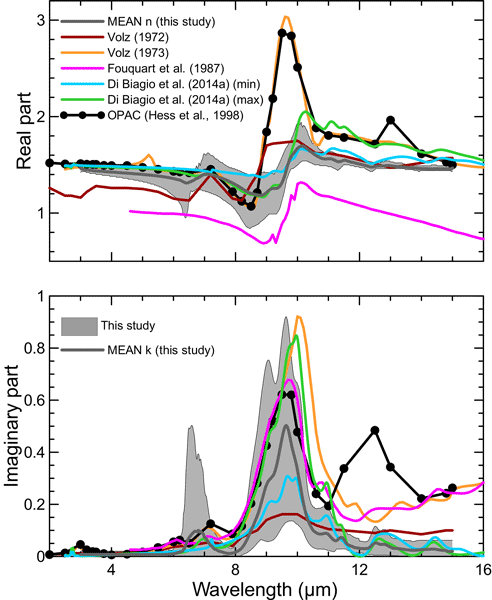 We use 22-year long continuous observations using laser radar soundings in southern France and satellite-based observations to distinguish between natural aerosol variability (caused by volcanic eruptions) and human-induced change in aerosol concentration. An influence of growing pollution above Asia on stratospheric aerosol is found. The present study investigates the effects of atmospheric dynamics on the supercooled liquid cloud fraction (SCF) during nighttime under different aerosol loadings at global scale to better understand the conditions of supercooled liquid water gradually transforming to ice phase. Statistical results indicate that aerosols’ effect on nucleation cannot fully explain all SCF changes, and so meteorological parameter also should be considered in futher parameterization of the cloud phase. To validate products of GOSAT, we observed vertical profiles of aerosols, thin cirrus clouds, and tropospheric ozone with a mobile lidar system that consisted of a two-wavelength (532 and 1064 nm) polarization lidar and tropospheric ozone differential absorption lidar (DIAL). We used these lidars to make continuous measurements over Saga (33.24° N, 130.29° E) during 20–31 March 2015. High ozone and high aerosol concentrations were observed almost simultaneously and impacted surface air quality. The contribution of the oil sands region to the local aerosol optical depth (AOD) is sought. Satellite data are used since they provide spatial coverage over many years. Satellites measure AOD with high correlation and small biases relative to coincident AERONET AODs. Trends are determined using annual mean AODs, and an increasing trend is found near the Shell mines. Spatially variable and high surface albedo is challenging for some sensors. Measuring polarization appears to be an asset. We combine satellite observations of carbon monoxide, ozone and aerosols with the results from a model using a technique called data assimilation. The generated global data set (CAMS interim reanalysis) covers the period 2003–2015 at a resolution of about 110 km. The CAMS interim reanalysis can be used to study global air pollution and climate forcing of aerosol and stratospheric ozone. It has been produced by the Copernicus Atmosphere Monitoring Service (http://atmosphere. copernicus.eu). We discuss characteristics, sources, and size distributions of the PM1 composition and OA components in Seoul, Korea, in winter. The serious pollution observed was caused by a combination of various factors, including meteorological conditions, emissions from local primary sources, secondary formation, and transport of air masses from upwind locations. This will be very useful for enacting effective PM reduction strategies for Korea as well as for the broader northern pan-Eurasian region. Molecular tracers have proven useful in estimating contributions of primary and biogenic secondary sources to atmospheric particulate matter but have lagged behind for anthropogenic secondary sources. This study takes a field-based approach to evaluate the detectability, specificity, and gas–particle partitioning of prospective anthropogenic SOA tracers. We conclude that a subset of species are likely useful tracers and are recommended for use in future source apportionment studies. Reduced visibility can indicate poor air quality. Using long-term visibility measurements, we explore the combined influence of aerosol particle and gas characteristics, and meteorology on long-term visibility. The measured data were fitted to a newly developed light-extinction model to generate predictions of historic aerosol and gas scattering and absorbing properties. This approach allows for estimation of historic aerosol properties where measurements are not available. Oxidation of biogenic volatile organic compounds by NO3 is an important interaction between anthropogenic and natural emissions. This review results from a June 2015 workshop and includes the recent literature on kinetics, mechanisms, organic aerosol yields, and heterogeneous chemistry; advances in analytical instrumentation; the current state NO3-BVOC chemistry in atmospheric models; and critical needs for future research in modeling, field observations, and laboratory studies. The concentrations of ~1–3 nm particles were investigated at nine sites around the world. 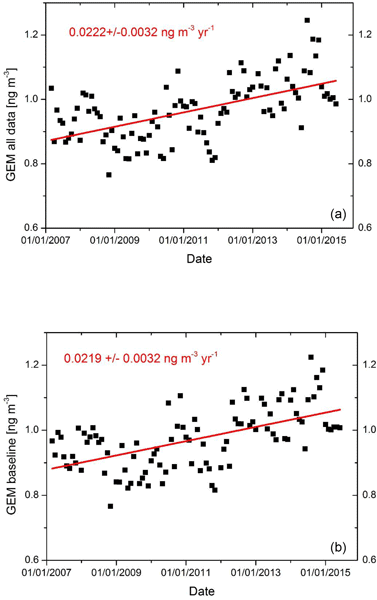 Sub-3 nm particle concentrations were highest at the sites with strong anthropogenic influence. Electrically neutral particles dominated sub-3 nm particle concentrations in polluted environments and in boreal forest during spring and summer. Sub-3 nm particle concentrations were observed to be determined by the availability of precursor vapors rather than the sink caused by preexisting aerosol particles. Benzo[a]pyrene (BaP) is a toxic compound emitted from various anthropogenic sources. This study is the first attempt to evaluate all major input and output components of BaP balance in the land-use zones of the eastern district of Moscow. Based on measurements of BaP atmospheric fallout and reserves in the soils, the critical loads of BaP were calculated for different values of degradation intensity. Ecologically safe BaP levels in the soils will only be reached after many decades or centuries. A 2014 snow survey was performed across northeastern China to analyze light absorption of ILAPs in seasonal snow, and modeling studies were conducted to compare snow albedo reduction due to assumptions of internal–external mixing of BC in snow and different snow grain shapes. The results show that the simulated snow albedos from both SAMDS and SNICAR agree well with the observed values at low ILAP mixing ratios, but they tend to be higher than surface observations at high ILAP mixing ratios. We present a model framework that accounts for coagulation in chamber studies where high seed aerosol surface area concentrations are used. The uncertainties in the calculated SOA mass concentrations and yields between four different particle-wall loss correction methods over the series of α-pinene ozonolysis experiments are also assessed. We show that SOA mass yields calculated by the four methods can deviate significantly in studies where high seed aerosol surface area concentrations are used. A long-lived (1 h) contrail and overshooting convection were observed in the tropics, near Darwin, Australia. The data are used to study the contrail life cycle at low temperatures and cirrus from deep overturning convection in the lower tropical stratosphere. Airborne in situ, lidar, profiler, radar, and satellite data, as well as a photo, are used to distinguish contrail cirrus from convective cirrus and to study the origin of the observed ice and aerosol, up to 2.3 km above the tropopause. Criegee intermediates are involved in the formation of secondary organic aerosols. How? Recent works show that they contribute to the oxidation of SO2 to SO3. We have found that the studied ozonolysis reactions only led to nucleation in the presence of SO2, which behaved as a catalyst. So the role of SO2 to form SOA depends on the structure of the alkene. For these reactions, the formation of low-volatility organic acid is expected to be responsible for nucleation, since SO3 was not released. This study uses an adiabatic cloud model to simulate the activation of smoke aerosol particles in the Amazon region as cloud condensation nuclei (CCN). The relative importance of variability in hygroscopicity, mixing state, and activation kinetics for the activated fraction and maximum supersaturation is assessed. Our findings on uncertainties and sensitivities provide guidance on appropriate simplifications that can be used for modeling of smoke aerosols within general circulation models. Viscosity measurements, along with the Stokes–Einstein relation, have been used to estimate the diffusion rates of organics within SOA particles. To test the Stokes–Einstein relation, we measured the diffusion coefficients of three fluorescent organic dyes within sucrose–water solutions with varying water activity. The diffusion coefficients were measured using fluorescence recovery after photobleaching. The results should be useful for predicting the diffusion of organics with SOA particles. How does downward planetary wave coupling affect polar stratospheric ozone in the Arctic winter stratosphere? Downward wave coupling (DWC) events impact high-latitude stratospheric ozone in two ways: (1) reduced dynamical transport of ozone from low to high latitudes during individual events and (2) enhanced springtime chemical destruction of ozone via the cumulative impact of DWC events on polar stratospheric temperatures. The results presented here broaden the scope of the impact of wave–mean flow interaction on stratospheric ozone by highlighting the key role of wave reflection. Exposures to bioaerosols depend on their type, particle size, and concentration. While typically found in coarse particles (2.5–10 microns), pollens, fungal spores, and bacterial endotoxins decrease to less than 2.5 microns and simultaneously increase in concentration during rain events. These observations contrast the assumption that rain washes bioaerosols from the air and reduces allergen levels. Instead, population exposures to bioaerosols are expected to be enhanced during rain events. Wildfire plumes in the western US were sampled at a high-elevation site in summer 2013. Three distinct BBOA types were identified, representing biomass burning OA with different degrees of atmospheric processing. Analysis of consecutive BB plumes transported from the same fire source showed that photooxidation led to enhanced mass fractions of aged BBOAs but negligible net OA production. A possible reason is that SOA formation was almost entirely balanced by BBOA volatilization during transport.